A former US army sergeant has pleaded guilty to involvement in a failed coup attempt in the Gambia last December. Papa Faal, 46, who has dual American and Gambian nationality, was arrested after he returned to the US. In court in the city of Minneapolis on Thursday, he admitted conspiring to carry out a coup and conspiring to export weapons without a licence. The plotters had attacked the presidential palace in Banjul but were repelled by guards. Several were killed and others, including Faal, escaped. "The intent was not to kill anybody" unless they were fired on, Faal told the court. "We were surprised by the fact that we had more resistance than anticipated." Faal said one person had given him funds to buy weapons and he had bought eight semiautomatic rifles in Minnesota. He broke them down into their constituent parts and shipped them to Gambia hidden in barrels. 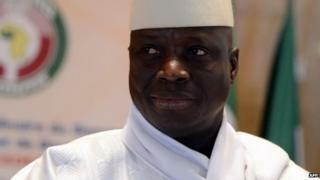 US officials found rifle manuals and receipts at Faal's home, as well as satellite images of Gambia in a folder marked "top secret". Faal will be sentenced at a later date. Documents submitted to the court said the plotters had originally planned to intercept the convoy of President Yahya Jammeh but switched their attention to the palace when they learned that he was out of the country. Another man of Gambian origin, Cherno Njie, 57, of Austin, Texas is accused of leading and bankrolling the coup attempt. He appeared in court in Baltimore earlier this month and is being taken to Minneapolis to face charges. He has not yet been asked to plead. Court documents say the conspirators' plan was for Mr Njie to take power if the coup succeeded. President Jammeh came to power himself in a coup, in 1994, and has been accused of crushing dissent. In 2011, he told the BBC he would rule for "a billion years".